A majority of Tanzanians live off the land - what grows from its soil, and the species that roam it. But these resources are scarce. Today, a host of problems are hindering environmentally sustainable development in the country, whether on land or at sea. A majority of Tanzanians rely on wood and agricultural residues for their energy needs, causing deforestation and environmental degradation. The problem, of course, doesn’t stop there. Deforested areas no longer provide a home for wildlife - leading to biodiversity loss - and are also susceptible to soil erosion. In 2007, TRAFFIC showed that organized illegal timber crime is causing millions of dollars worth of timber revenue to be lost each year in Tanzania. Who’s fault? Poor governance and rampant corruption in the forestry sector. What is WWF doing about the problems? 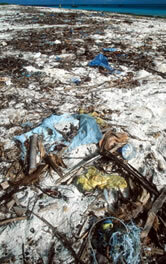 Plastic pollution on the beach, Zanzibar Island, Tanzania. Large cattle size and many goats may be a blessing for farmers, but when their numbers exceed the area’s natural carrying capacity, this can turn to a serious disadvantage. When vegetation disappears, the ground becomes exposed to soil erosion, which greatly reduces its ability to grow new plants. Eroded soil also runs into rivers and out at sea, where it smothers sensitive corals. In Tanzania’s major towns and cities, solid and liquid wastes are left untreated. As a result, air and water are contaminated with pollutants, a major health hazard for those who live in under-privileged areas. Take Dar es Salaam for example, where few people are connected to a sewage system. The few sewage systems that exists disgorge their waste directly into the ocean, affecting marine habitats and the species that live there. In village areas, people often resort to poaching. Sometimes, this happens in retaliation to wildlife attacks which destroy crops, and hence livelihoods. Such conflicts between humans and wildlife are also straining relations between wildlife authorities and local people. Mniwasa E., Shauri V. 2001. Review of the Decentralization process and its’ impact on environmental and natural resources management in Tanzania. Accessed online on June 20, 2007.